Gary Shteyngart, whose latest novel is “Lake Success,” in conversation with host Richard Wolinsky. Gary Shteyngart is the author of several novels, including “Absurdistan” and “Super Sad True Love Story,” along with a memoir, “Little Failure.” His latest book features a hedge fund manager on a road trip across America in 2016, and explains and satirizes the lives of the very rich. 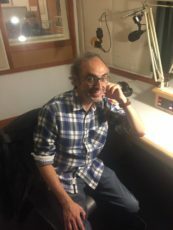 Gary Shteyngart took that road trip via Greyhound himself, and notes in the interview that virtually everything that happens to his character, Barry Cohen, happened to him. An extended 40-minute version of this interview can be found as a Radio Wolinsky podcast.